Is This the Most Valuable Private Coin Collection? If you've had the privilege of owning a rare coin, the chances are good that the coin had an interesting ownership history. Tracing the chain of custody of a particular collectible coin is one of the pillars of the numismatic hobby. There are a great number of rare U.S. coins that have become even more desirable due to the "pedigree" imparted on them by their past owners. Perhaps the most noteworthy example of this phenomenon is the Palace Collection of Egypt. It was compiled (sometimes ignominiously) by the country's last monarch, King Farouk, between the 1930s and the 1950s. 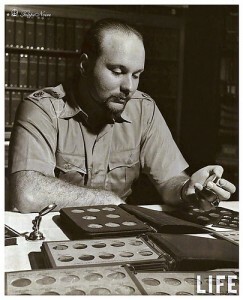 Farouk owned an astonishing collection of rare gold coins from around the world, especially the United States and France. It was "astonishing" in its size, completeness, and quality. He once owned the ultra-rare 1933 Gold Double Eagle as well as a pair of 1913 Liberty Head "V" nickels. The entire collection was hastily auctioned off after Farouk was deposed in 1952. Ever since, owning a coin that was once in Farouk's collection carries extra cachet, resulting in a higher premium paid by potential buyers. Another legendary collection of American coins is attributed to the prominent numismatist Eric P. Newman, who passed away in November at the ripe age of 106. Newman's array of U.S. coins was so massive that is has been broken up in many separate auctions over the past four years. Thus far, the Newman Collection has racked up $72 million at auction, with more than a half dozen individual coins realizing over $1 million. If you're assuming that these kinds of ultimate collections are becoming less common over time, you'd generally be right. One outlier would be the astounding Pogue family collection of exceptional 18th- and 19th-century U.S. coins, which is currently being auctioned in a similar fashion to the Newman Collection. However, CoinWeek recently reported on another mega-collection that has just surfaced. Dubbed the "Tyrant Collection," it spans thousands of years and includes coins from a variety of civilizations. It contains an array of ancient and medieval coins as well as more contemporary issues from around the world. The tyrant theme of the collection arose from the (thus far) anonymous collector's focus on large gold coins. He preferred those coins that bear the portrait of the ruler in order to bring the theme together. The entirety of the collection is arranged according to the civilization or empire that issued the coins, all of which are identified by a nearby body of water such as the River Thames in the U.K. One of the most impressive portions of the Tyrant Collection is a rare complete proof set of gold and silver coins bearing the image of King Edward VIII from 1937. Reportedly, the collection could be "worth hundreds of millions of dollars" in total. It will be on display at the Long Beach Coin Expo for the next several years, first appearing in February 2018.